Back in June I had the pleasure of sampling a 1972 Wild Turkey 86.8-proof KSBW (New York, NY “brown label”). While undisputedly a “dusty bottle” by date, the whiskey itself lacked the typical dusty notes found in most 1980’s and 1990’s WT bourbons. That doesn’t mean it wasn’t good whiskey – it most definitely was – it just came across closer to what I consider the “classic” WT profile. While the reasons for this variance are known only to Jimmy Russell, it’s very likely that the batch contained whiskey produced at another distillery. 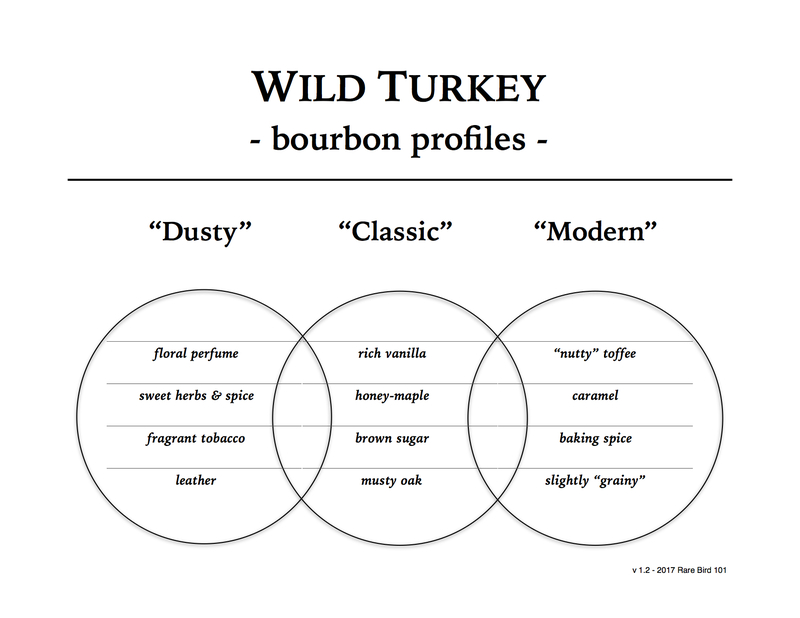 I’ve covered this in greater detail before, but basically Wild Turkey started as an NDP (non-distiller producer), the Boulevard distillery wasn’t exclusive to WT until its purchase in 1972, and any WT expression released prior to 1981 may (or may not) contain sourced whiskey. Today I’m reviewing a 1984 Wild Turkey 86.8-proof “brown label.” Flavor aside, this bottle differs from the ‘72 86.8 in several ways. First, there’s no age statement. I’m not exactly sure when the 7-year age statement was dropped from the 86.8 expression, but it was sometime between 1974 and 1983. This label also states “bottled by Austin, Nichols” in “Lawrenceburg, KY” instead of New York, NY (a change that first started in 1972 with 101/8 labels). And finally, there’s no display box accompanying this ‘84 86.8 bottle. That doesn’t mean it was never released with one, I’ve just yet to see one for this particular date. Of all the exterior differences between the 1972 and 1984 Wild Turkey 86.8 bottles, the removal of the age statement is arguably the most remarkable. Well, that and the fact that the ‘84 was almost certainly distilled at Boulevard under Jimmy Russell’s supervision. Hmm … so a minus and a plus? Now I am curious. Will this bourbon have the dusty notes the ‘72 was missing, or will it taste more youthful? Well, there’s only one way to find out. I think it’s time for a tasting! Overall: Well, one thing is for sure – this 1984 Wild Turkey KSBW has its own unique profile in comparison to the 1972 86.8 7-year. Is it strictly because of age? Not entirely. There is definitely younger whiskey in the ‘84, but it’s not harsh, watery, or anywhere close to “new make.” In fact, there’s even a few dusty notes here – particularly on the nose. The funky/musty oak and herbal/floral spice is reminiscent of 1980’s WT 101/8 – but – it’s considerably muted and barely present on the palate. What’s truly interesting is that I don’t think you can completely blame dilution for the lighter profile either. The reason I say this is in comparison to the 1991 Wild Turkey 80-proof “brown label” I reviewed last April, this 1984 86.8-proof is less complex. That says something when you’re talking almost 7 proof points of difference. So what makes the ‘91 WT 80-proof richer? My guess is maturity. Based on the intense complexity of 1991 WT 101 8-year (which is almost port-like in nature), I’m guessing Wild Turkey had some significantly aged barrels to dump in the early 90’s. It’s not a reach to assume that some of those barrels ended up in the 80-proof batches as well. In closing, this 1984 Wild Turkey 86.8 KSBW is just fine as an everyday bourbon. It’s extremely easy to sip, has enough flavor to keep it interesting, but in the end doesn’t really accomplish much more than that. While the old brown label bottles are undoubtedly cool to have sitting on your shelf (I just love that retro look), I honestly wouldn’t invest too much energy trying to acquire a non-aged-stated 86.8 bottle. You’ll be just as happy with modern WT 101 or Russell’s Reserve 10-year, and even happier with Russell’s Reserve Single Barrel.